The Palestinian Authority (PA) was offered the Jerusalem-area Arab town of Abu Dis as the capital of a future "Palestinian state," PA Chairman Mahmoud Abbas said Sunday. Speaking at a meeting of the Palestinian Liberation Organization’s Central Council, Abbas said, "Jerusalem is the eternal capital of the state of Palestine...our future is in danger." "What would you want if Jerusalem were to be lost? Would you want to make a state with Abu Dis as its capital? That’s what they are offering us now. Abu Dis." 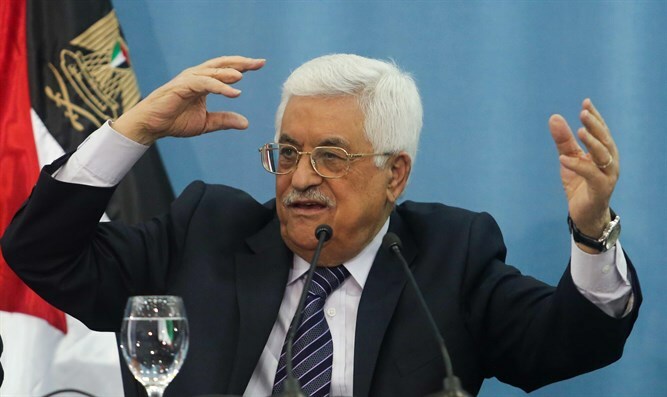 Abbas also said he had refused the offer. "We won’t take orders from anyone," he said. "We told Trump we will never accept his [peace] plan. His 'deal of the century' is the slap in the face of the century, and we will not accept it." During his address, Abbas also claimed that the Oslo agreements, beginning with the 1993 Declaration of Principles on Interim Self-Government Arrangements, better known as the Oslo I Accord, were nullified. "I am saying that Oslo, there is no Oslo," said Abbas. "Israel ended Oslo." Responding to Abbas' speech, Defense Minister Avigdor Liberman (Yisrael Beytenu) on Monday morning told Army Radio, "This is a speech of the destruction of the house of Abbas, and it signifies a loss of composure, a loss of support from the moderate Arab world and, of course, a renunciation of negotiations."